Over the last three decades, U.S. interest rates have been on a steadily declining path. This decrease has been caused by a variety of secular factors, including an increased focus by the U.S. Federal Reserve toward controlling inflation, and more recently by actions by central banks worldwide aimed at spurring economic growth. The prolonged decline in interest rates has also fueled a steady bull market in bonds. Investors therefore prefer these more attractive bonds, which forces prices of existing bonds up until rates equalize. Outlook: Will Interest Rates Continue To Decrease? After peaking in 1981, U.S. interest rates have been on a downward trend, as investors have become less concerned about unexpected inflation. Prior to 2008, the main underpinnings for this trend include an increased focus on the part of the Federal Reserve toward controlling inflation, with several cycles of tight monetary policy. This tight monetary policy tends to lower the growth of money supply and available credit, which then slows price increases in the economy and thus leads to lower inflation. Low and relatively stable inflation in turn is seen as positive by investors, who then may demand a lesser risk premium as protection against asset devaluation. In addition, increased labor productivity and a focus toward improved energy efficiency lessened the U.S. economy’s exposure to supply shocks arising from labor or energy shortages. This further decreased the risk premium demanded by investors as protection from unexpected inflation. Following the global economic downturn in 2008 and 2009, many investors sought the relative safety of bonds, and the resulting asset flows had the effect of increasing bond prices and driving down yields. The current low level of interest rates may also be attributed, at least partially, to actions taken by central banks to improve the availability and affordability of credit. These actions were part of an effort to spur economic growth. Key among these central bank actions is the U.S. Federal Reserve’s decision to set its target Federal Funds rate to be in the 0.0 percent to 0.25 percent range. The Federal Reserve has also acted to lower long-term bond rates, including the outright purchases of long-term U.S. treasury bonds and mortgage-backed securities. Known as Quantitative Easing (QE), these actions increase the demand for long-term bonds, thus driving their prices upward and lowering long-term rates. Other central banks, most notably in the United Kingdom and in Japan, have also taken similar actions. So far we have focused our discussion on nominal interest rates. However, many investors may feel that what truly matters to them are “real” rates, which measure the return on investment after inflation is taken into account. On this measure, short to intermediate rates have been negative since mid-2011. It may be argued that the recent low levels of interest rates can persist only in the presence of continued central bank intervention. As investors can be expected to require a positive rate of return on their investment, without central bank support, real interest rates are likely to begin on a path toward being net positive. This likely means rates at higher levels as compared to what investors have experienced over the last several years. We believe that as the U.S. economy improves, the Fed is likely to gradually wind down its accommodative stance. This means that the QE programâ€”which tends to lower longer term ratesâ€”may be gradually phased out. This is likely to be followed by the Fed gradually increasing its Federal Funds rate. These Fed actions are also likely to take a long period of time and be “data-dependent.” This means that over the next several years the Fed may speed up the pace of accommodation slowing as economic data improves, or that policies may remain unchanged if the data indicates a slowing recovery. As the Federal Reserve winds down its accommodative stance, we expect that rates will gradually return to “normal” levels. This generally means that short-term rates (for maturities of 1 year or less) will be running at or slightly above the rate of inflation. Meanwhile longer-term rates (for maturities of 7 to 10 years) will be running at a rate equivalent to inflation plus the rate of current GDP growth. For example, an inflation expectation of 2 percent and GDP growth of 2.5 percent per year will imply short-term rates close to or just above 2 percent and long-term rates close to or just above 4.5 percent, with the move happening over the next several years. Many investors will note that this type of move will mean a 1 percent to 2 percent increase in rates from more recent levels. If this move were to happen immediately, it may cause a sharp decline in bond prices; however, we do not expect that this large of a change will happen overnight. It is more likely that long-term rates will start to gradually move up, first as QE starts to be wound down and then ends. The shorter end of rates is then likely to also rise as the Fed gradually ratchets up the Federal Funds rates in or after 2015. In a period of rising interest rates, bond prices will experience downward pricing pressure. This may mean some increased price volatility in bond fund returns, possibly leading to a negative total return over short periods. As investors are aware, bonds in general have two ways of generating a return on investmentâ€”income stream/yield and price appreciation. The income stream/yield tends to act as a stabilizing item, protecting investors from negative price movements. Table 3 above shows how performance of the Barclays U.S. 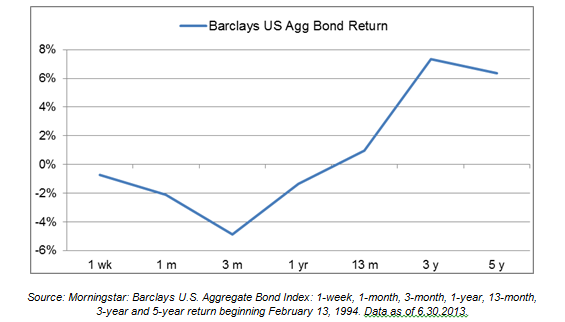 Aggregate Bond Index fared after rates increased in 1994. The initial rate decreases drove bond prices down, resulting in negative returns over the one-week, one-month and three-month timeframes. Investors would note that over short periods, the yield received by bonds is not enough to offset a price move. However, over longer periods, in this case 12 to 13 months, returns were back to flat, and then continued to improve in the positive over time, especially over three to five years. Investors should also note that over time, the larger portion of bond returns is generated by yield. This can be seen from Table 4 below and can be intuitively explained as wellâ€”although there may be some price volatility over time, the appreciation of bonds is limited, and if they are held to maturity, bonds return only their par value. 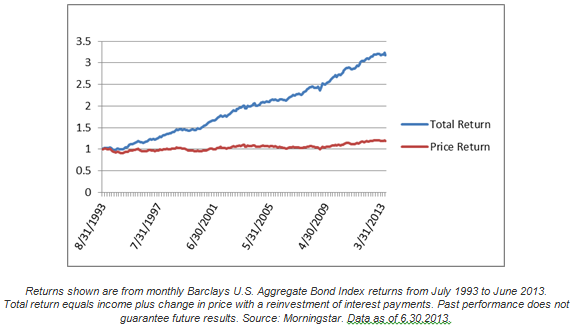 Therefore the majority of investor returns in bonds are generated by yields. The price sensitivityâ€”appreciation and depreciationâ€”of bonds is determined by a characteristic known as “duration.” It measures the average time for which a bond’s payments are received, in present value terms. As bond prices move in the opposite direction of rates, long-term bonds are more sensitive to rate moves, as their duration tends to be longer. As an example, given a 1 percent move up in rates, a bond with 1-year duration is likely to lose 1 percent of its value, while a bond with 5-year duration is likely to lose 5 percent. Of course, the other way bonds may make money is yield. So even though the 1-percent rate increase causes prices to drop, over the course of 1 to 2 years, the drop is mitigated by the yield received. However, because current yield levels at present tend to be low, they are likely to provide only limited protection. 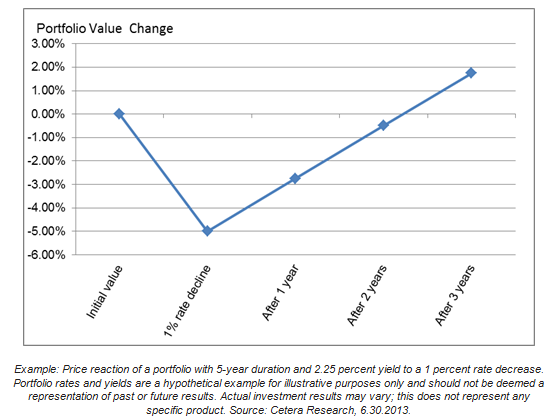 Table 5 below shows how a portfolio with 5-year duration and 2.25 percent yield might react to a 1-percent rate increaseâ€”as can be seen, returns are lower as rates decrease, but over the course of approximately 2 years, the portfolio’s ongoing yield helps recover the value lost. Bonds can also have periods of low to negative return. Such periods are much rarer and typically less severe as compared to equities. However, even in fixed-income bonds, several good years may be followed by a flat to a slightly negative period. As bonds are considered “safe” by most investors, a negative return in bonds can still be hard to fathom, and may cause investors to act impulsively. For this reason, we still believe it is important to keep things in perspective by focusing on long-term goals in asset allocationâ€”over a 2- to 3-year horizon, bonds will still have added diversification even if more recent returns are flat to negative. 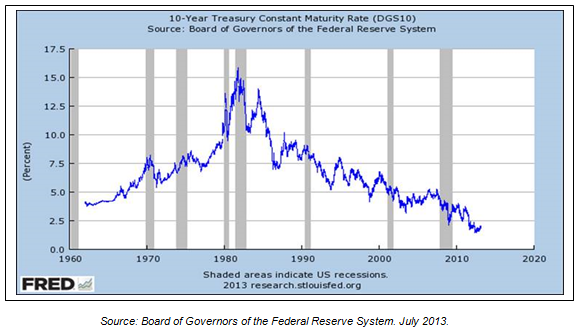 We do not expect the bond market to experience a prolonged period of low returns. The consistent yield provided by bonds helps returns to be stable, and unlike stocks, this predictable recurring income gradually brings returns back into the positive. Because the markets tend to anticipate Fed moves, it is also possible that interest rates may be more volatile, with some overreaction and a subsequent price reversal happening when news hits. Investors should be careful not to make rush decisions based on short-term price movements, which may lock in a loss just before rates reverse. It is very difficult, and some argue it to be impossible, to predict exactly when rates will rise. Markets are generally anticipatory, and tend to react to expected central bank moves well in advance of the actual move, often with an overreaction to one side or the other. However, given a prospective trend toward increasing rates, investors can prepare their portfolios for the trend and be more conservative. Intermediate bond funds which have positioned themselves shorter than benchmark. However, short-term investments also carry lower yields and investors should balance yield needs, with the focus on lower duration investments to lower overall interest rate risk. Floating-rate fixed income securities offer a yield which varies based on the current rate or price on an underlying index. In a period of rising rates, such securities may not decrease in value, or their prices may actually increase as more investors focus on the asset class. Floating-rate loans are one of the most common types of floating-rate fixed income securities. These loans as a category may also be referred to as Bank Loans, Senior Secured Loans, or Senior Floating-Rate Loans. They represent variable-rate, senior and secured debt issued by corporations, many of which are rated below investment-grade. Loans are issued with floating-rate rate/coupon, which is based on a variable rate index, with the London Interbank Offered Rate (LIBOR) being most common. Loans are senior in a firm’s capital structure over other debt holders, and frequently carry specific collateral. In the event of a default or bankruptcy, investors in floating-rate loans receive their principal and income before other claimants. Floating-rate loans also generally have higher recovery rates than other bonds of the same corporation in case of default. Over the last several years, floating-rate bank loans have established themselves as an asset category. There are many solid mutual funds which invest in floating-rate as a primary objective. Given the characteristics above, our view is that bank loans may provide a level of stability in an environment when rates rise. This category also has low historical correlation to most asset classes and a higher yield, which may cushion against unexpected market fluctuations. In addition, similar to other credit sensitive bonds, defaults are likely to remain low in a rising economy. While we believe that bank loans offer good interest rate risk protection, we do not think their rates will increase in the near future. Many bank loans are issued with a so called “LIBOR floor,” where rates will not move until LIBOR rates move above 1.2 percent to 1.3 percent. As LIBOR is currently in the 0.2 percent to 0.4 percent range, a true rate increase is still more of a long-term prospect for bank loans. Are Variable Rate TIPS a Good Idea? Treasury Inflation Protected Securities (TIPS) are also floating-rate bonds. However, their rates are tied to inflation and NOT to the overall level of interest rates. In a situation where rates increase and inflation remains tame, which many see as the likely case, TIPS may NOT increase in value. Quite the oppositeâ€”if rates rise while inflation is stable, TIPS values are more likely to decline because of their higher duration. Therefore, we would not recommend that investors focus on TIPS at this time for interest rate risk protection. However, they may still be suitable for investors who seek protection from unexpected changes in long-term inflation. Yield spreads represent the additional yield premium paid by issuers of riskier bonds to compensate investors for the increased level of risk. Yield spreads generally increase as economic conditions decline, as a weaker economy makes it more likely that riskier bonds may default. But as the economy improves and issuing companies have improving sales and higher cash flows, it is more likely that bonds will be paid in full since companies are better able to repay debt obligations. For this reason, as the economy improves, these additional risk premiums/spreads are likely to contract, a trend known as “spread compression.” Spread compression acts like a rate decrease and is positive for credit-sensitive bonds, typically leading to a higher bond price. This means that in a rising economy, spreads are likely to move in the opposite direction to Treasury rates, thereby offsetting some of the price movement on credit sensitive bonds. As we mentioned above, a move to “normal” interest rates is likely to occur as the Fed ends its stimulus programs. However, since we only expect the Fed to start removing stimulus when the economy begins to strengthen, the spread compression scenario described above may be expected to happen at the same time as treasury rates increase. On the left, all bonds react to rate increase, but bonds with higher yield have a better 1-year recovery. The table on the left shows that a spread decrease lowers the bond’s rate sensitivity, with credit sensitive bond returns unchanged given a 0.25% rate decrease and a 0.25% rate compression. Please note that Treasuries (listed first in this table) include no credit spread and are not likely to benefit from compression in an improving economy. Annual Yield â€“ (Duration x Rate Move). As indicated in this example, bonds with higher yield/spreads have more protection from a move in interest rates. In addition, as shown in the second table on the right, spread compression may help offset some of the negative price movement in bonds due to the interest rate increase. For very large interest rate/price moves, the current relatively low spreads will not offer a complete protection, as evidenced by the 1-percent rate increase scenario. However, investors should still keep in mind that price moves tend to be an isolated event. Over time, the bond yield will still bring returns into the positive; it may just take a bit longer with a large price move. Please note that the scenario above assumes no defaults. In reality, some high-yield bonds are likely to default, possibly at a rate as low as 2 percent or as high as 5 percent to 7 percent. Therefore, investors should not allocate a substantial portion of their assets to high-yield investments based on current yields alone. As discussed above, spread asset classes may provide some protection from rising Treasury rates, as spread compression may offset some of the rate increase. Investment grade bonds: These are bonds issued by U.S.-domiciled corporations, and normally trade at a risk premium /spread compared to less risky treasury bonds. These bonds are susceptible to investment rate risks, but also carry “credit risk,” which means that the spread or risk premium may increase as the economy worsens, or decrease as the economy improves and corporations are in better financial shape. As interest rates tend to increase when the economy improves, simultaneous spread decreases tend to offer a good protection over Treasuries. Investment grade corporate bonds are rated from AAA (closest to U.S. treasury bonds) to BBB (riskiest), but overall as a class tend to have low occurrences of default (when the corporation is unable to pay bondholders back). In improving economic conditions, many corporations may have improving financials as well, which can lead them to be upgraded to a less risky rating. This ratings upgrade is typically accompanied by a decrease of the risk premium for these bonds, which is a positive for these bonds, and may also offset a concurrent rate increase. High-yield bonds: These bonds are also issued by corporations, but have an additional default risk relative to Investment Grade Corporates. As these corporations are weaker in cash flow, or have high leverage, they are more likely to be in a situation where they cannot pay investors back. Investors demand a premium for this, and that is why high-yield bonds have higher rates overall than corporate bonds. But in a rising economy, default rates tend to decrease, and therefore high-yield bonds may be able to benefit from spread compression, even to a higher extent than corporate bonds. High-yield bonds also have higher coupons relative to Treasuries and investment grade bonds, which are more likely to protect investors from a downward price move. Non-U.S. bonds denominated in U.S. dollars: The United States has one of the broadest and most liquid financial markets worldwide. As a result, many foreign issuers offer bonds in U.S. dollars to be able to gain access to U.S. investors and a broader acceptance in the U.S. markets. They may also be issued by countries (sovereign bonds) of non-U.S. domiciled corporations. In theory, the bonds of these issuers are still subject to interest rate risk, but they also are less tied to the U.S. economy, so they may provide some added diversification. Non-U.S.-dollar-denominated bonds: These bonds are not in the U.S. dollar and may provide some diversification, since rates on international bonds may not move in tandem with U.S. bonds. These bonds may be issued by countries with improving economic conditions, where internal policies may lead to price increases at the time U.S.-denominated bonds weaken. Non U.S.-dollar denominated bonds are likely to provide some added diversification, but do not add an explicit protection against rising interest rates. Equities: Interest rates are still low by historical standards, supporting good equity valuations and allowing corporations to reissue old debt at lower rates. Thus, the case for equities may still be strong despite the rally we’ve had for the first half of 2013. As long as it is in line with their long-term investment objectives, investors may want to consider a modest short-term equity overweight, instead of allocating all their assets to short-term investments/cash at close to zero rates. This equity overweight carries added volatility of course, and we would recommend that investors make only small changes of their bond allocation into equities. Preferred Stocks: Preferred stocks may also offer an alternative for diversification. Preferred stocks are a hybrid between bonds and equities, and pay a fixed dividend rate. Given the expectation that corporations may have improving fundamentals, preferred stocks may also trade up along with equities. Also, with a higher coupon (approximately 6 percent), they may protect investors better in rising rate environments. However, preferred stocks are not issued as broadly as standard stocks, and as a result tend to be relatively less liquid. Therefore, we would typically recommend these instruments in low allocations and primarily for adding diversification. Alternative Investments: Investors may also want to diversify a small portion of a portfolio’s fixed income assets to absolute return investment strategies (alternative investments) that have similar risk profiles to fixed income. Strategies like this include Equity Market Neutral and, to a lesser extent, Equity Long/Short and Managed Futures. Should Investors Still Invest in Bonds? Our answer to this is a resounding “yes.” Despite the expected rise in interest rates, bonds still provide a good diversification compared to equities and help lower portfolio volatility. As rates rise, newly issued bonds with higher yields may be more attractive as an investment. Many investors are focused on the impact if interest rates increase, but the world is a complex place, and other risks exist in the economy. While a slowing economy is now less likely than in 2009, an economic downturn can still occur. We remind investors that GDP growth is also still below long-term averages. This means that interest rates are likely to remain low, and many risky asset classes may underperform if traders move into safer assets. In this case, a solid bond allocation is likely to provide the stability that investors expect. Those who decide to exit bonds altogether may forgo this benefit. Is This Rise in Rates All Bad News? Rising yields are not necessarily all bad. As indicated above, real return has been negative on bonds for some time. This has depressed the potential earnings of income retirees from traditional fixed income portfolios. It has also pushed investors into relatively riskier asset classes, where investors who need current income have accepted more volatility to gain needed income. If rates return to normal levels, this will bring bonds back to their natural position of providing stability and inflation protection in investor portfolios. Positive net yields (likely to occur initially on long-term bonds, and eventually on cash), also mean that bonds will offer investors better protection from inflation, better support to income portfolios going forward, and the ability to do so with less volatility. Finally, a more “normal” rate environment also means that the economy is stable enough to grow on its own. This should be good news for most investors, as even though the bond portion of their portfolios may not be doing great, economic growth is likely to boost returns in equities and help a well-diversified portfolio. As always, we recommend that investors see their financial advisors for recommendations in these asset classes. This information compiled by Cetera Financial Group is believed to be from reliable sources; however, we make no representation as to its completeness or accuracy. The information has been selected to objectively convey the key drivers and catalysts standing behind current market direction and sentiment.